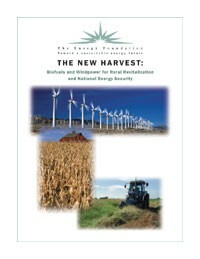 America’s rural landscape is the place to substantially address both rural economic and national energy challenges. Clean energy development produces new income streams for farm communities and, by displacing oil and natural gas imports, improves U.S energy security. Renewable electrical power generated by wind farms and clean biofuels derived from crops, now just niche players in the U.S. energy picture, can provide a significant share of American energy demands. Download the report.